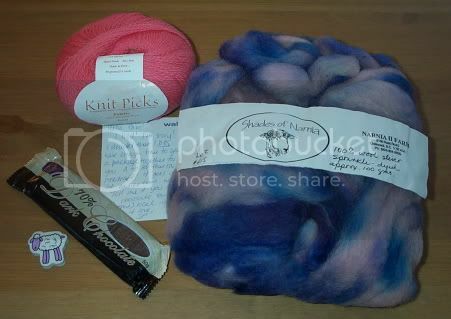 That is a ball of KnitPicks Palette in “Petal” – a gorgeous shade of pink, a very sweet note, a yummy-looking bar of dark chocolate (which I will be hiding from hubby), a little sheepy eraser, and 100g of spectacularly lovely roving in pinks and blues and purples. I absolutely need to practice with my spindle so that I can spin this and make something awesome from it. The sheepy eraser will be keeping me company at my computer, and I think I have decided that the Palette will be stepping in to replace the ball of “Bark” I was going to use for the Lace and Fair Isle Pullover from the Vogue Holiday Issue. I got out the Lemon, Apricot, and Twig that I bought for it, and when I took the Bark out and put the Petal in, it went from so-so to really pretty. Suddenly, I really want to work on this sweater! Isn’t it funny how just one ball of yarn can do that to a project? Thank you so much, SP – I love my goodies! I hope you are having fun on your trip! There was also a package today from Jimmy Beans Wool. This was the first time I had ordered from them, and I was impressed with their service. I got an email within a very short period of time letting me know that something I had ordered was out of stock and asking if I wanted to sub colors or wait for it to come in. (I opted to wait) Today, I received the package with the in-stock items (which are for my SP and will therefore not be appearing here) and they put a couple of peppermints in with it – how cute! Oh! With the Olympics updates, I totally forgot to post pictures of the yarn I picked up when Jen and I went to All About Yarn on Monday. 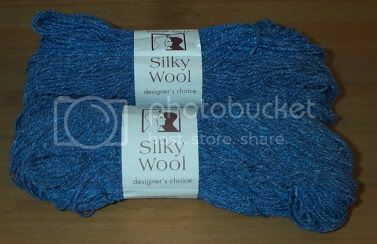 I picked up two skeins of Elsebeth Lavold Silky Wool in “Woad” (which totally appeals to the King Arthur fan in me), with plans to make myself a second Branching Out. It was such a nice denimy blue that I thought it would go really well with a lot of things. 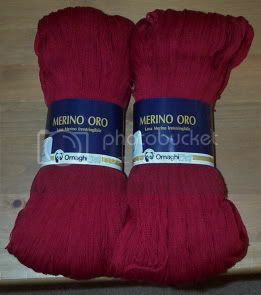 I also found this gorgeous lace yarn – Ornaghi Filati Merino Oro in color 1208 – a wonderful deep red. No idea what I am going to make out of this, but it is going to be something challenging, just to be worthy of this amazing cobweb-weight lace yarn. (I’m thinking something from my copy of Folk Shawls) If anyone has used this yarn and has any suggestions/wisdom/warnings, I’m listening. And finally, I could not leave without this amazing hank of Cherry Tree Hill Cascade Lace – 1000 yards of 100% silk in the “Gypsy Rose” colorway. I kept looking at it, and picking it up, and putting it back down, but I finally decided that I could not walk away without it. It needs to be something awesome, but I’m not sure what just yet. For now, I am content to just admire it. February 15th, 2006 | Tags: Fiber, RAKs and SP Stuff, Yarn Acquisitions | Category: Misc. 5 comments to I Got a Present!!! Oh wow, you have some gorgeous stuff piled around! Can’t wait to see what you spin out of that roving. And the new color combination absolutely clicks. YAY! I’m so glad you liked the package! The trip is going well. Question: How do you feel about Hello Kitty? And you know what’s crazy? I have the exact same colour of the Merino Oro! I’m thinking of making the Field of Flowers shawl from Fibertrends? I think Hello Kitty is adorable – reminds me of being a kid and having little Hello Kitty stationery stuff. Wow, that’s a great package! Spin away! She has made three stunning shawls from Merino Oro (two of which actually from Folk Shawls). Now I will need to get this book.